Cambridge, UK, (day, date, 2016) – Generating onscreen images of sharks and creating the illusion that they are swimming with real fish in an aquarium has to be the ultimate AV challenge. BrightSign, LLC®, the global market leader in digital signage media players and Dubai-based system integrator DigiComm achieved just that with the completion of the new Shark Week exhibit at Dubai Aquarium & Underwater Zoo. Using nearly 91 screens driven by 42 BrightSign players, DigiComm combined digital technology with a living aquarium to create for visitors the experience of swimming among Great White Sharks and other large and dangerous fish without the actual fish being present. The experience was created by Emaar Entertainment, the leisure and entertainment subsidiary of Emaar Properties, and Discovery Consumer Products, in association with OSN, the region’s leading pay-TV network. At the front of the exhibit, 28 massive 55” LG screens driven by 7 BrightSign 4K players with tiled outputs featuring an awe-inspiring scene of Great White sharks circling a cage of divers. There are also three LG 86” stretch 4K displays with a resolution of 3840 x 600 pixels on entry and exit. Entering the exhibit, visitors walk straight into the world’s first interactive digital shark cage with Great Whites swimming around them. “The visitor becomes the diver – they experience the excitement of diving with real sharks in a cage,” says Abdul Bakhrani, CEO, DigiComm, who created the exhibit. The “cage” consists of 48 55” LG screens again driven by tiled BrightSign 4K players. Situated under the hull of a research ship protruding from the wall of the Aquarium, the digital cage was designed exclusively by DigiComm for the exhibit. The presentation is spectacular – occasionally one of the sharks leaps towards the cage, and appears to crack the screen. This sequence is accompanied by blood and a very realistic sound effect. Synchronization of the video and the effects is handled flawlessly by the BrightSign players. 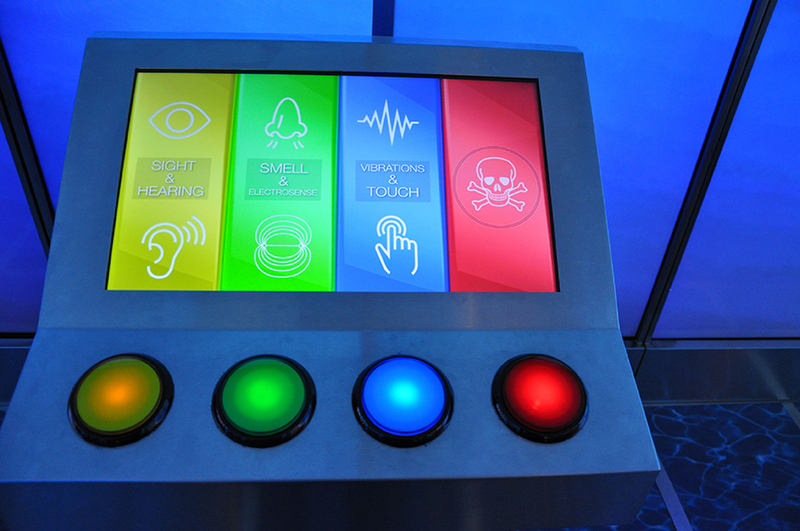 Innovative technology allows guests to ‘interact’ with the sharks whilst simultaneously learning about their biology. DigiComm used the luma key masking feature offered by BrightSign players, allowing graphics and other videos to display through transparencies in the video window. Visitors in the cage can use buttons to select additional video which plays on top of the main looping presentation. These videos explain, for example, how the shark’s senses work. The buttons control the players directly using the UDP inputs. The roof of the cage is a translucent material, on which projectors powered by BrightSign display images of shark bellies to complete the visitor’s experience. Continuing, visitors are offered a further world: a 20 meter aquarium demi-tunnel, with the back wall of the tank formed of LG LED screens. The real fish swimming in front are apparently of one piece with the graphical images of sharks on the screen behind. Using touch screens interfacing directly to the BrightSign players driving the screens, guests can select which shark species they would like to see swimming on the LED screens in the background. Educational interactive information panels enable a better understanding of the incredible animals. The tunnel is based on two 7m x 3m and one 3m x 3m 4mm pixel pitch LG LED displays driven by three BrightSign XD232 players. “The sharks inside the exhibit represent the 100 million sharks that are finned every year. This is a practice that we need to stop. We hope this exhibit delivers that message,” said Paul Hamilton, general manager and curator of Dubai Aquarium and Underwater Zoo. Finally younger visitors are offered five portrait screens with fun shark facts. Each one is a two-minute clip delivered by BrightSign players, controlled by a motion sensor driven by the young visitor. The whole exhibit features 42 BrightSign players. There are 22 4K models at the front of the cage. The output of many of these are tiled to drive a 4K video on four LG 55” HD screens each. Eight BrightSign HD players are used in four kiosks with buttons to drive the four overhead projectors in the shark cage ceiling. Three BrightSign XD1132 players are used in touch kiosks and BrightSign LS422 players with a motion sensor drive five LG 22" displays in portrait orientation for the children’s shark facts.